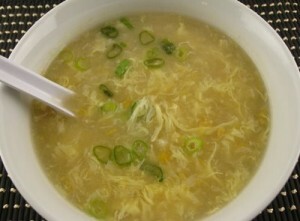 Chicken Corn Soup recipe by abrarhussain_73 at DesiRecipes.com. Its a delicious appetizer. And tastes great specially in cold weather. Wash and Clean the Chicken . Strain the stock in strainer to remove whole spices and garlic . Separate the meat from bones and shred it in thin pieces. avoid it from lumps) and mix it well. If you feel lumps strain it in a strainer. Put the corn flour in stock and mix it well. Take 2 beaten egg whites and put it in the stock and mix it fast so that egg whites doesn't form lumps but it forms thin threads then put the shredded chicken , black pepper powder, chinese salt , and vinegar . Take boiled eggs and cut them in small slices and put them in stock as well. stock is becoming thicker by time. per taste in the soup bowl and enjoy. Its a good appetizer.